This level has medium difficulty. 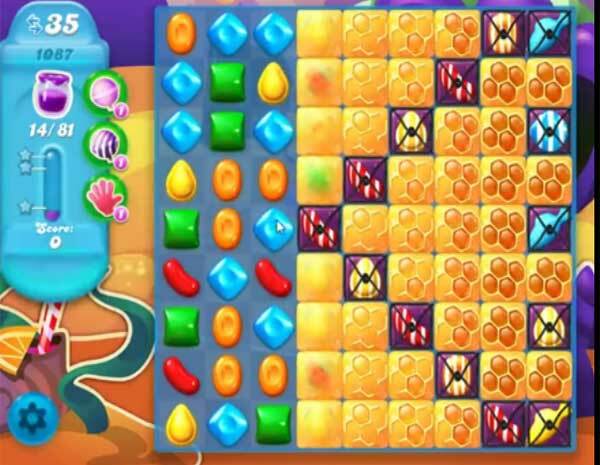 For this level try to play try to near to blockers or make special candy as you get the chance to break more blockers or play near to jam to spread them to near candies. HA!! 1)medium difficulty?? I think NOT!! 2) 30 moves NOT 40 3) regardless you need about 60 moves 4) the only way you MIGHT get this level is if you have a color changer and sprinkle together. 5) of course this is a King game so what do I expect, other than cheating, unfairness, and frustration!! If anyone is reading this check out Indy Cat game!! MUCH more fun!! Not sure why I waste my time on these king games!! Cannot do anything with this level, far too many blockers, I’ve hardly cleared any by the end. Why does it say 40 moves above, shows 35 moves on the video and i only have 30 moves, what a right mess this game is.